With the vast ocean spaces, the livelihoods of most of the Pacific Island Countries (PICs) and territories revolve significantly around the opportunity for sustainable use of the ocean and its resources. This will significantly contribute to reducing their economic vulnerability and expand their narrow resource base by optimizing the benefit from the size and extent of their EEZs and the mineral resource potential that occur on the seabed. In recent years the interest in some of these mineral deposits has moved from just scientific resource assessment to commercial interests. This is due largely to the high grade of base and precious metals contained in Seafloor Massive Sulphide deposits together with sustained high prices of key metallic minerals. The meeting recognized that the establishment of SOPAC in 1972 was in large part due to the need for assessment of deep sea mineral resources in the region. 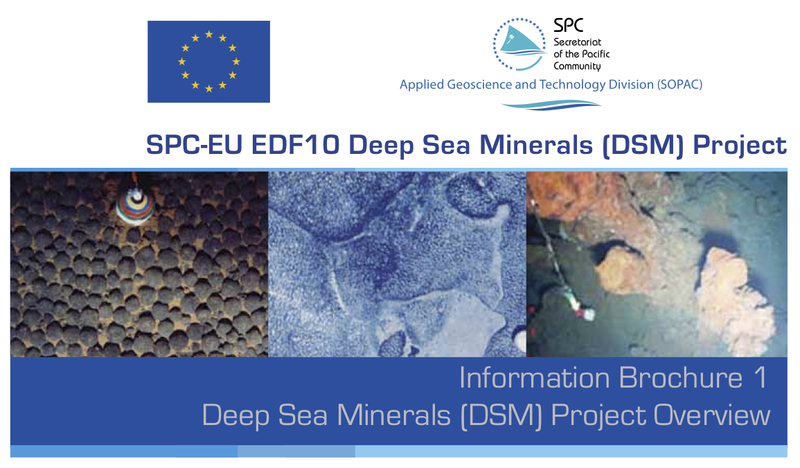 Subsequently and largely coordinated by SOPAC, marine scientific research and seabed mineral resource assessments within the region have located and identified a varied group of mineral occurrences on the seabed within the EEZs of many PICs. The meeting acknowledged the current support of the European Union through the 10th EDF Pacific Regional Programme for the funding to support this 4-year project (2011-2014) entitled “Deep Sea Minerals in the Pacific Islands Region: a Legal and Fiscal Framework for Sustainable Resource Management”. The overall objective of the project is to expand the economic resource base of Pacific ACP States. The specific purpose is to strengthen the system of governance and capacity of Pacific ACP States in the sustainable management of their potential deep sea mineral resources through the development and implementation of sound and regionally integrated legal, fiscal and environmental frameworks, improved human and technical capacity and effective monitoring systems. The meeting acknowledged the risks associated with deep sea minerals and the opportunity to sustainably manage them. The meeting further acknowledged that there is no such circumstance as “No Risk”. Having accepted that as a reality, the task at hand is to “Know Risk”. In other words it is a joint responsibility to work together to assemble all the necessary data and information leading to knowledge and a better understanding of risk, and ultimately the determination of an acceptable level of risk. This meeting recognised that determining the level of acceptable risk in regard to the topic of deep sea minerals and potential for mining can be difficult and attracts differing opinions around the region. This is something that PICs need to address and perhaps discuss through a regional consultative process. This High Level Meeting provided the opportunity to have an interactive dialogue so all can become better informed about deep sea mineral issues, challenges and opportunities and, through this Project and other initiatives, move forward together to better understand and determine the level of acceptable risk and ultimately contribute in some manner to improving the livelihoods of Pacific communities. The deliberations concluded with agreement that the correct way forward is a strategic one which is built on the following: (i) inclusiveness, and (ii) interactive dialogue, which lead to (iii) incremental actions by which means sustainable management of deep sea minerals may proceed for all Pacific States concerned. SOPAC ‘s [Secretariat of the Pacific; Applied Geoscience and Technology Division] DSM project in the Pacific seeks to ‘expand the economic resource base’ of Pacific Islands Countries. Below are links to their recent publications relevant publications. If you have any queries SOPAC can be contacted directly on akuila@sopac.org. The goal of the project is to expand the economic resource base of Pacific ACP States by facilitating the development of a viable and sustainable marine minerals industry. The objective is to strengthen the system of governance and capacity of Pacific ACP States in the management of deep-sea minerals through the development and implementation of sound and regionally integrated legal frameworks, improved human and technical capacity and effective monitoring systems. Minerals and mineral products are important for the development of any nation. Every segment of society uses minerals and mineral products everyday. The roads we ride or drive on and the buildings we live learn and work in all contain minerals. Since the beginning of civilization minerals have been extracted from onland sources and used in various development sectors. With the discovery of manganese nodules on the seabed more than a century ago, the potential of deep sea mineral deposits have not been realised until recent success in exploration efforts that trigger growing interests for commercial mining. Potential seabed mineral deposits are composed largely of metallic minerals and some are considered strategic metals due to their specific uses. It is therefore crucial to describe minerals and understand the process of extracting them in simplified terms. Most Pacific Island Countries have large ocean space compared to their smaller land masses. Under the ambit of the United Nations Convention on the Law of Sea (UNCLOS), most of these island countries have significant ocean space that are legally recognised to come under the direct control of individual countries. Ocean and seabed resources including minerals that occur on the seafloor within national waters belong to each country and are managed and governed under national law. Marine minerals encompass minerals that occur on shallow and deep ocean environments including nearshore and continental shelf areas as well as deeper ocean seamounts, mid-ocean ridges and ocean basins. Seabed mining can be subdivided into two components: shallow marine mining and deep sea mining. Shallow marine mining largely refers to the extraction of mud, sand and gravel for construction purposes and in some cases can also refer to the mining of valuable minerals in the nearshore shallow waters. Mining for construction sand and gravel in shallow marine areas has been ongoing in various parts of the world for a long time and is common in the Pacific Islands region. In contrast, mining for nearshore precious stones (diamond and other gemstones) has only been undertaken in recent times and is more common in the coastal areas of southern Africa. On the other hand, mining of deep sea mineral resources is considered to be more challenging due to the water depth in which these minerals occur. Apart from a number of trial mining ventures there has yet to be any system successfully developed to undertake commercial mining in the deeper part of the ocean. However, recent development in technology suggests that deep sea mining will soon be a reality. Mining produces significant volume of waste materials that need to be moved and managed. Safe disposal of mining waste is generally recognized as the single largest environmental challenge facing the mining industry worldwide and a major expense for mining companies. Similarly if deep seabed mining commences within the Pacific Islands region, the management of mining waste will pose the greatest challenge for any environmental protection initiatives. Historically, environmental impacts emanating from onland mining waste can be widespread and may continue to affect livelihoods, health and the environment long after the mining has ceased. Some common impacts are forest clearance, land disturbance and removal, change of landscape due to excavation (Figure 1), disposal of significant amount of waste material, and pollution of watershed and nearby areas. of which tectonic activities (e.g. earthquakes and landslides), high rainfall, rugged topography, and rock type competency problems are the notable ones in the Pacific that usually affect efforts to construct proper waste storage facility. In addition, social issues such as community re-location, contamination of water sources, land ownership and access problems may also impact on the choice of waste disposal option. Mining waste poses an environmental threat not only through its volume but also because of its toxicity. It is the major product of any mining operations for metallic minerals representing around ninety nine percent (99%) or more of the total materials produced in the form of waste rock and tailings (Figure 2). Adverse impacts emanating from the disposal of this waste are often externalized, that is, they are passed from the operators to other parties or the public. If not properly managed mining waste, can result in short and long-term impacts such as the smothering of surface waters and/ or the release of hazardous substances (i.e. heavy metals and sulphide minerals from which sulphuric acid can be formed) that can cause significant environmental damage with potential adverse consequences on livestock and human health. Deep-sea minerals that occur within the Exclusive Economic Zones (EEZs) of many Pacific Island Countries (PICs) are increasingly being recognised as a future potential source of revenue and economic development. In the PICs, approximately eight million people live on small landmasses dispersed over the large span of the Pacific Ocean. These islands have a combined land area of 550,000km2 compared to an area of 38.5 million km2 of ocean territory or EEZs (Figure 1), a ratio of 1:70. For many of the smaller PICs, deep-sea minerals may represent the only exploitable natural resource sector apart from fish. Apart from minor occurrences of other minerals such as phosphate and metalliferous sediments, there are three major types of polymetallic mineral deposits that are recognised on the world’s deep seafloor environment today, namely, Manganese Nodules, Cobalt-rich Crusts (CRC), and Seafloor Massive Sulphide (SMS).